The Cacapon and Lost River is located in the Appalachian Mountains of West Virginia’s eastern panhandle. Well loved by paddlers and anglers, this American Heritage River is surrounded by a lush valley of wildlife and flora that is part of the Chesapeake Bay watershed. Although this area is still rural and mostly forested, development and land fragmentation in the Cacapon and Lost River Valley have increased over the last decades. 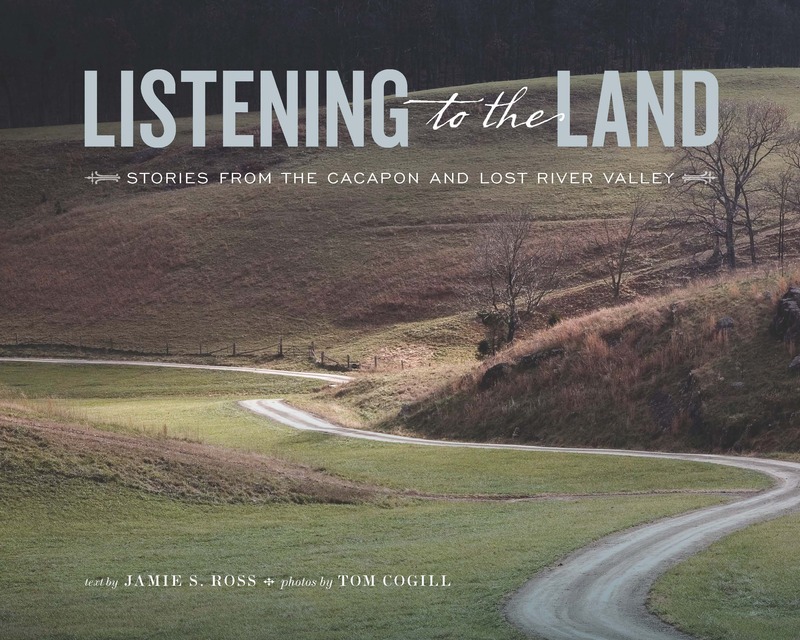 Listening to the Land: Stories from the Cacapon and Lost River Valley is a conversation between the people of this Valley and their land, chronicling this community’s dedication to preserving its farms, forests, and rural heritage. United around a shared passion for stewardship, the Cacapon and Lost Rivers Land Trust and local landowners have permanently protected over 11,000 acres by incorporating local values into permanent conservation action. Despite the economic pressures that have devastated nearby valleys over the past twenty years, natives and newcomers alike have worked to protect this valley by sustaining family homesteads and buying surrounding parcels. This partnership between the Land Trust and the people of this Valley, unprecedented in West Virginia and nationally recognized for its success, greatly enriches historic preservation and conservation movements and brings to light the need to investigate, pursue, and listen to the enduring connection between people and place. Project Director and Writer Jamie S. Ross, has worked for over thirty years writing, directing, and producing documentary work on American history and culture. Most recently she was producer and co-writer of the acclaimed four-part PBS environmental history series, A History of Mountains and People, (www.appalachiafilm.org) , selected as the Best Video of the Year by the American Library Association. For her work on the series, Ross received the Mountain Hero award from the Mountain Institute. She has been named a National Scholar by the Council on Basic Education and has served as a Fellow at the Virginia Foundation for the Humanities. Ross is also director of Red Dirt Productions, and along with Red Dirt Productions, is currently at work on a documentary that will explore the history of the South as told through the foods of the Southern table. Tom Cogill is a freelance photographer, born in Hollywood, California, and for the past thirty-five years has been a resident of Charlottesville, Virginia. He photographs mostly non-famous people for magazines, university publications, and annual reports. His work has appeared in US News & World Report, American Heritage, National Geographic, NG Traveler, Science, Nature, the Chronicle of Higher Education and other publications. For the past 10 years he has worked increasingly in documenting the work of individuals and foundations doing social projects in Latin America. See www.tomcogill.com. Peter Forbes is the founder of the Center for Whole Communities, a writer and farmer, facilitator and speaker, and lives in Vermont and works across the country. His story is told at www.peterforbes.org. When not farming with his family in the Mad River Valley of Vermont, Peter travels the country helping communities, organizations, and citizen leaders be their wisest selves. Nancy Ailes is the Executive Director or the Cacapon & Lost Rivers Land Trust. She represents the eighth generation of her family that has lived in Hampshire County, West Virginia. Having had varied career opportunities and accomplishments, Nancy is most proud of her work permanently protecting land in the Cacapon & Lost River Valley. Rodney Bartgis is State Director of The Nature Conservancy in West Virginia. He is a native of Berkeley County, has a biology degree from Shepherd University and a Master of Science degree from West Virginia University. He currently lives in Randolph County. "When I owned property in the Lost River Valley, where my life’s work was inspired, I admired the principles and values of the landowners. I also realized that if the special beauty of this place was to be conserved, it would only happen if this was what the local people wanted. As you read the history of these individuals, you will understand how the Cacapon River Watershed became what it is today. This precious resource could not have been placed in more loving and caring hands. These hardworking people have passed along a national treasure so unique and important to future generations and the environmental health of the entire Chesapeake Bay Watershed, that we cannot ignore its presence. By more fully understanding their love of this community and the land, we can join with them in their quest to preserve the natural habitat and their heritage. Together we have the rare opportunity to protect one of the most biodiverse, and one of the last remaining intact watersheds in the entire Chesapeake Bay drainage." "After years of building relationships with communities throughout the nation, the Land Trust Alliance has discovered something truly essential to land conservation – people love to hear stories about their land. 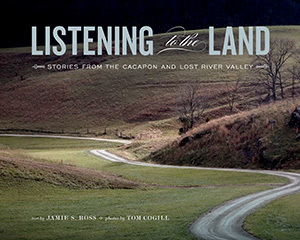 The Cacapon and Lost Rivers Land Trust truly celebrates these connections in Cacapon Voices through the stories of people who love a place so much that they put its protection ahead of their own needs. These stories give me hope for the future of land conservation because these are stories about the why of saving land, not just the how."